If you just went out a bought the Galaxy S3 or the Galaxy Note II most of you are looking for some cool accessories, well today Samsung is giving Galaxy smartphone users in the United States an amazing new way to enjoy music on the go called Galaxy Muse. Coupled with the Muse Sync Android app, Samsung is providing Galaxy S III and Galaxy Note II owners an innovative new way of syncing music that frees them from their PC. 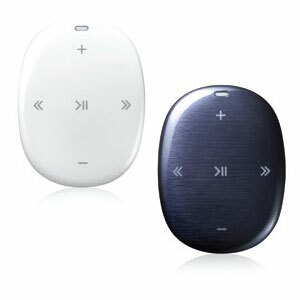 Galaxy Muse is a small, lightweight MP3 player that shares several physical features and design aesthetics with the latest Galaxy smartphones, including a rounded, natural design and matching Pebble Blue and Marble White color scheme. In addition, Galaxy Muse provides users up to six hours of play time, 4 GB of memory, and rich, spacious sound quality thanks to Samsung SoundAlive optimized audio technology. With SoundAlive, users notice deeper bass and enhanced tone when listening to their favorite songs, as SoundAlive intelligently adjusts sound quality and clarity. Users can get their music on the Galaxy Muse by simply downloading the Muse Sync app from the Google Play marketplace or Samsung Apps. 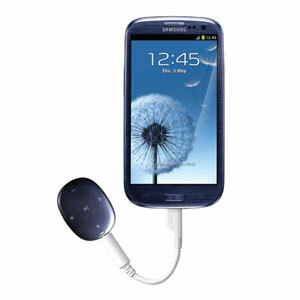 After connecting Galaxy Muse to the Galaxy S III or Galaxy Note II via the included connector cable (USB to 3.5mm headset jack), users can sync the songs they want and leave their phone behind. Due to its wearable design and small form factor, users can take Muse along in place of their smartphone as a portable music player at the gym or on the go. Galaxy Muse also comes equipped with a durable, built-in clip for attaching the device to a shirt or pocket, so it’s wearable and offers the convenience of hands-free listening. Within this compact and clean design, Muse offers enough capacitive controls to become a user’s primary music player. Skip, shuffle, pause, or go back and listen to your favorite song again and again. Galaxy Muse is available in Pebble Blue and MarbleWhite for $49.99 at Samsung.com. The Samsung Muse Sync mobile application is available free from Samsung Apps and the Google Play marketplace. For more information on Galaxy Muse, go to http://www.samsung.com/us/mobile/cell-phones-accessories/YP-W1NAL/STA.